What is going on at Team Durango? At this stage the answer to the question many people seem to be asking is nobody knows! Ok, let’s go back a step, there has been a few things that have been annoying me about Team Durango over the last year. Trying to get a DEX210 V2 or V3 body for example. for the last 12 months few if anybody seems to have managed it! But I never put anything together with something happening until I read this Inside Line RC article this morning http://www.insidelinerc.com/off-road/durango-dnx8-discontinued-is-there-more-to-the-story/ . 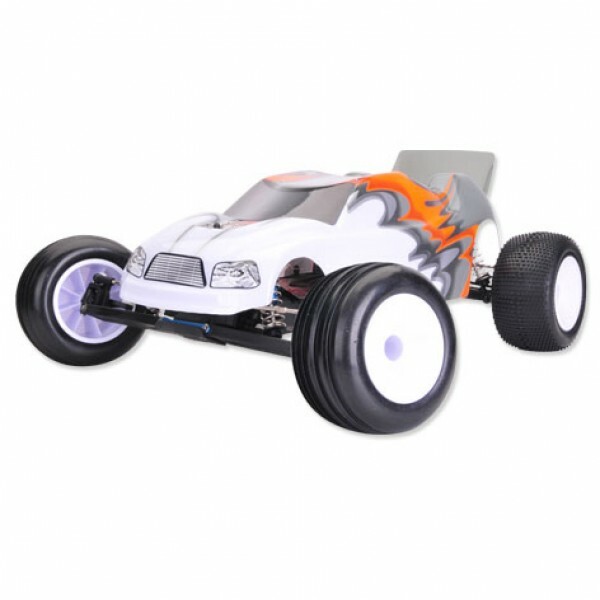 The gist of it is that the new DNX8 buggy from Team Durango is showing on Tower Hobbies/Hobbico as Discontinued. Now this car was only announced early in 2015, a 1.5 year lifetime is extremely short for any platform. Ok, so the IFMAR 1/8 World Championships are coming up, but it seems a little off to me. Other models are also listed as temporarily unavailable as well. Of note these items are not listed as unavailable or discontinued on the Team Durango website. Next came the confirmation this afternoon (again hinted at in the Inside Line RC article) that Travis Amezcua, who is to many the public face of Team Durango, has parted ways with the company. Again this could be a case of greener pastures, or just time to move on, however the only thing hinted at in recent online postings from Travis was only hinting at new products that couldn’t be revealed. Exciting maybe, but then to leave in the next breath seems … odd. Maybe it’s the conspiracy theorist in me LOL. Still, it adds a certain amount of drama to the lead up to the IFMAR Worlds doesn’t it! It is strange the things that motivate you sometimes, after racing at a major race meet on the weekend, and being perfectly happy with my RC Fleet, I find myself desiring a Stadium Truck once again after having a HPI E-Firestorm many years ago which had a number of modifications for racing, only to have nobody to race against!! Unfortunately Team Durango are no longer making their DEST210R truck, so maybe I need to convert my Short Course DESC210R with a few parts…. However this, combined with teasers of the new Xray XT2 Stadium Truck got me thinking about what is available out there, so let’s have a look! I’ll look at racing kits at this stage, I will cover RTR Stadium Trucks another day as there is a lot of them out there. Now don’t be fooled into thinking that all stadium trucks are electric, this is far from the case with many nitro powered trucks appearing over the years and a few that are still available. Kyosho and HPI both still sell Nitro powered Stadium Trucks, they have just fallen from favor when 1:8 Truggies started taking center stage. Now a little history for those who may not be aware, Stadium Trucks, often just referred to as trucks are based on 2wd buggies with truck bodies, wider arms, larger tyres and often longer chassis. And while that remains true of many of the original Stadium Trucks like the Tamiya Stadium Blitzer, the same remains true today. So the current ST from TLR is the 22T 2.0 which is an upgrade from the original 22T released not so long ago as a part of the re invigoration of the Losi racing range under the TLR banner. Rear or mid motor mount is your choice in this kit in a very sleek design with a narrow (and not so spacious, chassis. The newest Stadium Truck on the block, and the one about which we know the least! We presume it will be based on the XB2, and that is about all we know. When we know, you will know! 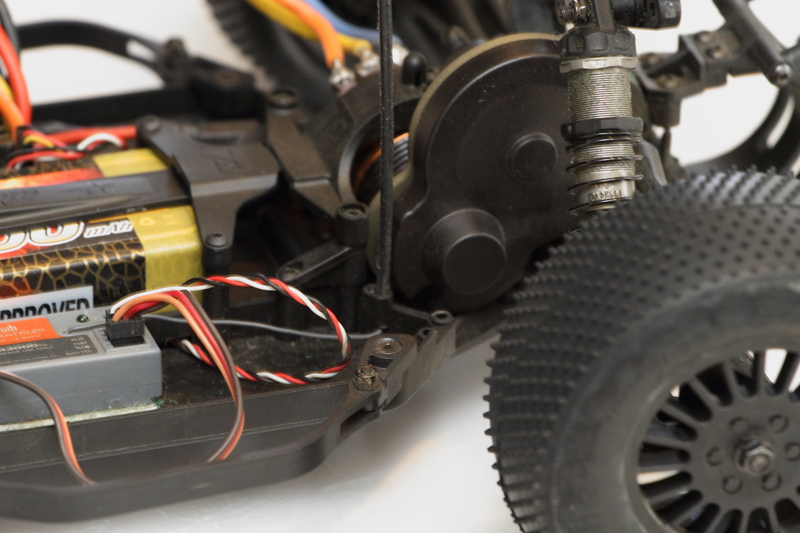 RC10T5M or the shorter name it is most commonly known by, T5M is the latest from Team Associated, however with the release of the B6 and B6D there may well be a new version out some time in the near future. This kit can trace it’s roots back to one of the original Team Associated Classics, the RC10T, and what a classic that is. 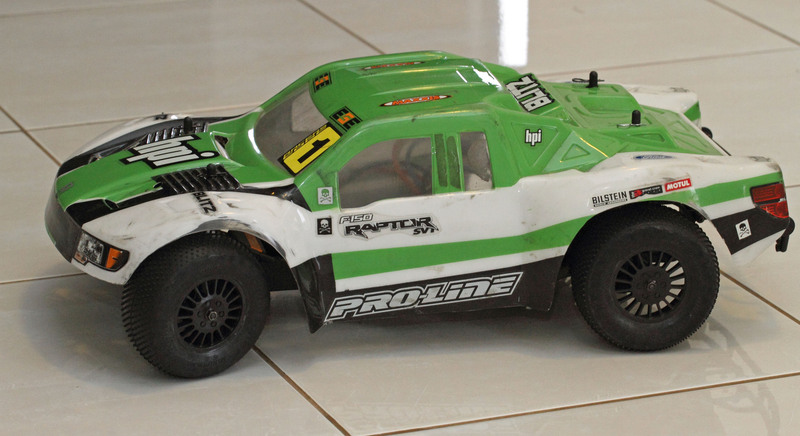 Honestly with the original RC10 being re released, I am amased the RC10T has not followed suit. The T4.2 however is also still available in it’s rear motor mount only setup, but as an RTR, so that is for another day. The T5M conversely is mid mount only so you really need to choose a kit to suit the surface that you are driving on, loose dirt or high traction clay or carpet/astroturf. 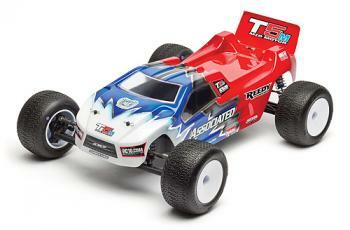 The Ultima RT6 is the latest truck from Kyosho released not too long after the new RB6 buggy. Kyosho design and quality is hard to go by if you can afford it. All in all a beautiful truck that has all the adjustment and tuning you could ever need. It almost goes without saying that Mid and Rear engine mount configurations can be built from this truck kit. Team C isn’t a name you hear that often about the traps, but they do still sell a Stadium Truck in the form of the TC02T truck based once again from their buggy. Whilst it is a slightly older design than some of the other trucks available, it will still put a smile on your dial. This one is slightly from left field, but X Factory have been making conversion kits for Team Associated cars for many years. Their X-60CF kit takes a T4 / 4.1 / 4.2 and turns converts it to the X Factory ST with a carbon fiber chassis and Mid motor configuration, something Associated only has done with the T5M recently. Last but not least I do have to mention one sadly departed kit, the Team Durango DEST210R. Yes, I know that it is no longer in production, but I mention it because A) I hope a new version will appear, and B) because it was the first ST (correct me if I am wrong here) to come where you could choose a Mid or Rear mounted motor position right out of the box, and switch them as needed. Team Durango’s kits have been doing this since they released the DEX210 in 2011 and this feature has carried through to the Stadium Truck and Short Course Truck based on the same platform. As i’ve gotten back into ST’s I am thinking that I will buy the needed parts to convert my Short Course Durango into a Stadium Truck (Chassis, body and wheels), so i’ll let you know how that goes! 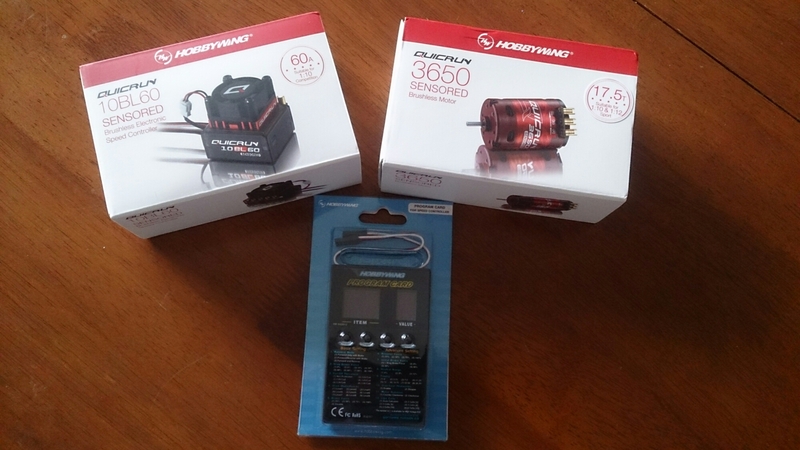 Yes, i have finally spent some money on some more gear for racing. Yes, I wanted to buy the slick new Team Durango carpet Buggy, the DEX210F, but the budget demon just couldn’t justify the price compared with a 2nd hand V2. Also my son is racing more and more and needed a racing design Buggy. So I am upgrading to the V2 Team Durango Buggy, and my son gets my old V1. I will keep my electronics and he gets the new Quicrun combo which cost me $133 from eBay with program card from Hong Kong, an excellent budget speedy and motor combination from a tried and tested company. Reviews in both will appear as time permits, so keep your eyes peeled. US driver Travis Amezcua is running the new DEX210F from Durango, another car that combines the rear end of a 4wd and the front end of a 2wd buggy to create a astro/carpet specific chassis. 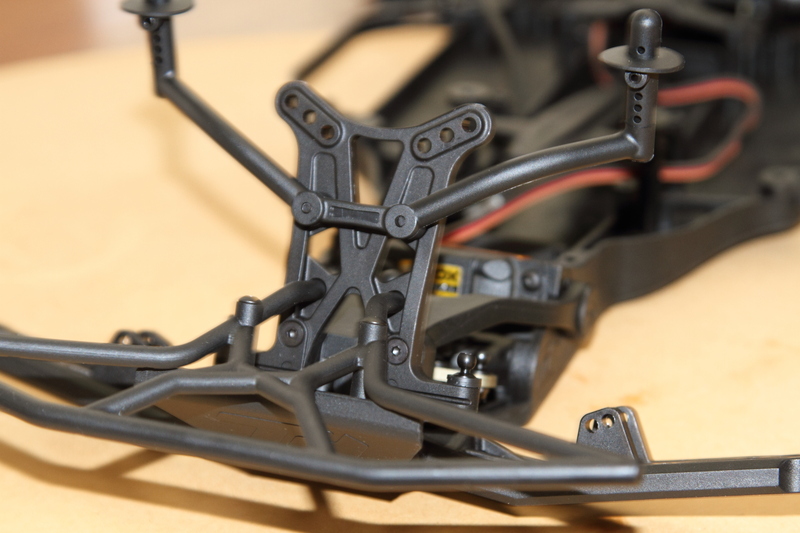 Using the parts from both the companies buggy platforms it is a new chassis that brings them together and we are told that the complete kit will be released by the end of the year. Having never raced on Astro prior to this race, Travis has had to seek the help of the British Durango team for set-up and adjustment help as he originally battled with push, but is no struggling with off power oversteer. Neobuggy has come through again with pics of a new 2wd car from Team Durango. I like it more than the HB car so far, looks to be half of the 410, half of the 210. That said we have not seen under the hood of the new TLR or Associated cars, but somebody sign me up for one of these when i can get my hands on one! So this was the first Durango kit that I had from new as my buggy was a 2nd hand purchase. I was very impressed with the way the whole kit went together from start to finish. Great fit and finish, some great design in a number of areas and so on. BUT, what I didn’t like was the manual. There were some places where part numbers were missing or downright wrong. I know this is an older kit now, and considering I paid $165 US on special at Tower Hobbies (about $210 AUD landed at my door) I can’t complain too much as it was an absolute steal! Another Bittersweet moment was the updated parts. As well as an updated chassis there was a few related updated parts to install as well, and as there were 2-3 updates on top of one another, it was very confusing in places. Team Durango really need to look at a revised manual encompassing the changes and removing the pieces that are not required. However I suspect a new 2wd SCT will be forthcoming from them soon, so it is a moot point in a sense. So while the kit stacked up to, and exceeded the quality of, other kits I had made, the instructions were inferior to the Tamiya and HPI manuals I am accustomed to. The shocks I think deserve a special mention. They go together so well, bleed easily and inspire confidence in their design. I took one slightly unconventional step here of not painting the Team Durango body, and it still remains on the shelf in the shed. Why? Because I had a perfectly good Proline SCT body sitting there in my colour scheme that I had not sold with the Blitz, so with some careful re drilling, and a little trimming around the rear bumper, the Proline body is fitted, and works quite well! The front bumper actually sits behind the front of the body, but that doesn’t fuss me. Otherwise, it looks good, has so much adjustability that I don’t know where to start, and seems strongly built in the right places. I like the way that the front and rear bumpers move in a solid hit taking some of the shock out of the impact. I think the empty rear motor mount looks a littles strange sitting out the back all empty, but I guess it does the job and expatiates the mid to rear mount changeover with a minimal number of parts. One design that I didn’t like is undoing the spur gear cover on the updated chassis, the lower screw is really hard to get at because of the reinforcing that is not there on the original chassis. But i’d rather a tough to get at screw than a broken chassis. Here is the cover screw in question, the bottom one of 2 screws that hold on the spur gear cover. 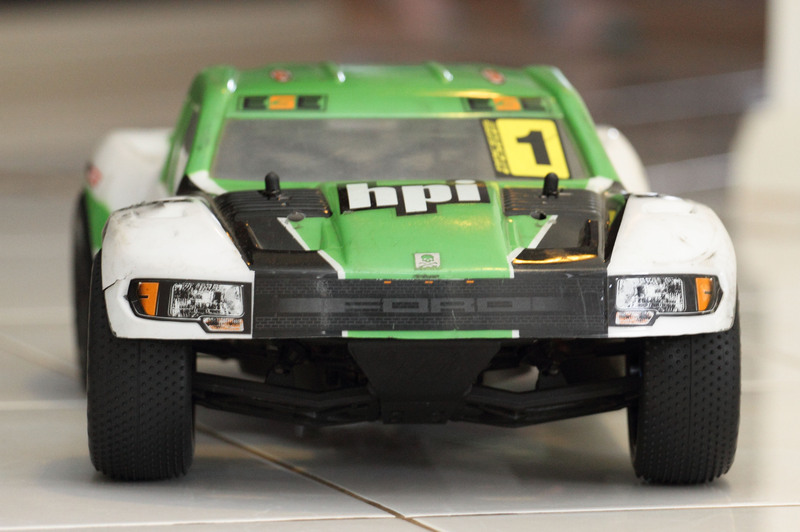 So mostly I have been driving this car on the carpet track at Launceston R/C, but I have had it on some dirt and on the bitumen as well, and to be honest, even as a mid mount it handles everything I can throw at it. Being a racing kit, with a huge range of adjustment, you can make it handle any situation with the right tuning. However the setup I am running with is working pretty well for me so far with some good decreases in lap times as I make adjustments. Most of the adjustments on the DESC10R are the normal ones, pistons, shock tower and body position etc etc. 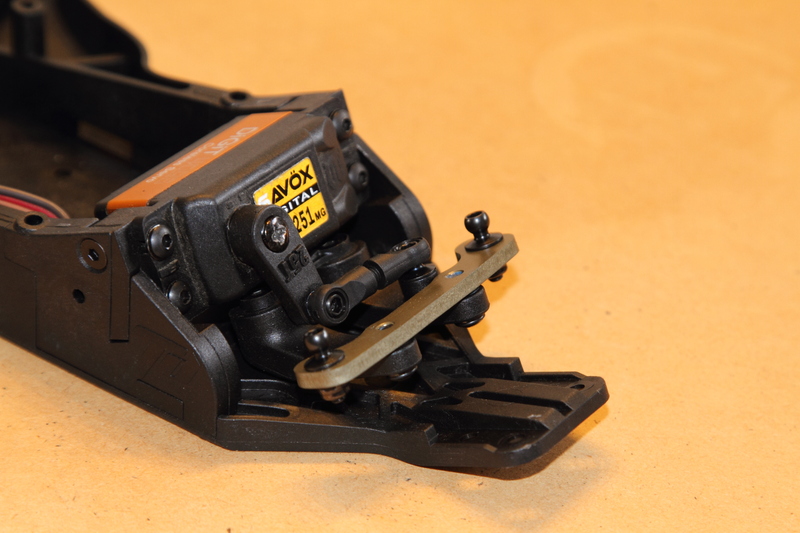 It is the caster adjusted by removable slugs that I find fascinating and a very accurate way of doing the adjustment without a bag full of spare parts. The toe is at the rear is adjusted in the same way. Similarly the adjustment of the front axle positions, trailing or leading, is adjusted with inserts provided with the kit. These design features make for an impressive array of accurate adjustability right out of the box. Another tuning option that gives a lot of flexibility is the battery position. You can run a full standard length pack in mid or rear configuration, with space to spare to move the pack forwards or backwards. The only problems arise when you lose the foam blocks or steal them for your buggy. I do need to get some more of those! Droop screws are also an unusual feature in a kit of this scale, something that does get adjustment with the low height that SCT’s on the track here tend to use. I did purchase and fit the optional gear differential instead of the ball differential because me and ball diffs, we don’t get along! and on carpet the gear differential seemed more suited to the surface. Unlike on my last review, I am the primary driver of this vehicle and it gets raced against some very quick opposition at my local club. It also gets raced against some less than gentle opposition, which combined with my less than pro driver ability, means that the durability has had quite a workout, on the track at least. So far massive air, bug crashes, and a lot of traction rolls while improving the setup have resulted in, well …. no damage to date. So i’m pretty happy as I hate spending parts on spares! Ok, so far I have not needed any spares, which is a pus, but parts are readily available from Local Hobby Stores as well as the big overseas stores. So you should have no problems there. Prices are generally very good as well. Maintenance has been fairly easy this far, shock oils are quick and easy to change, gearing adjustment is a little tricky thanks to the issue that I mentioned earlier with the spur gear cover. All in all an easy truck to work on. This truck would suit anybody from a first timer through to a pro. The only major downside being the confusing updated parts. The only thing I am really disappointed with is the wheel bearings which will be receiving an upgrade when I get the chance. Equaly at home on the track or in the yard as a basher, this jack of all trades has it all in my opinion. Durability for the beginner and precision and adjustability for a racer. New 2wd Buggy for Team Durango? You often see scoops of prototype cars from big race meets and so on from the media, but for a manufacturer to scoop their own R&D team, unusual, but that is what Team Durango has done! 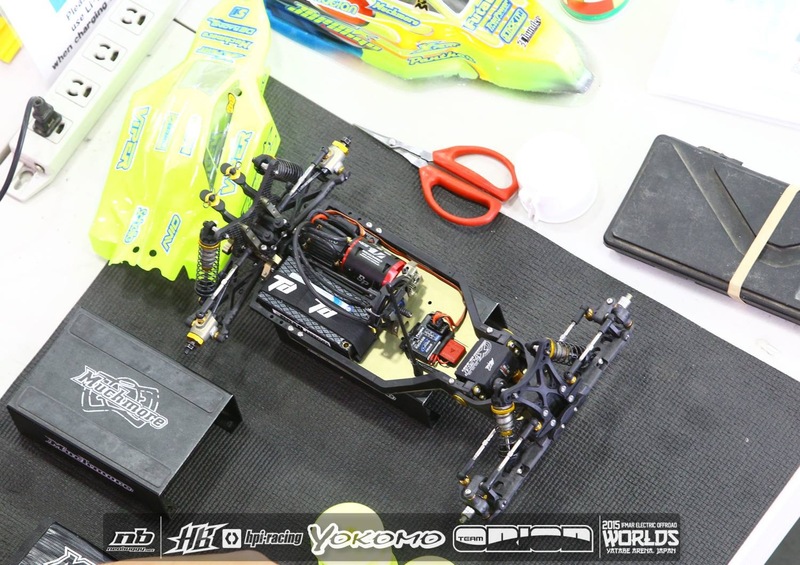 Looks like a very low slung 2wd prototype, probably specifically for the World Championships at Yatabe Arena. Some are suggesting a flat gearbox like some other manufacturers have available or aftermarket, only time will tell I guess!